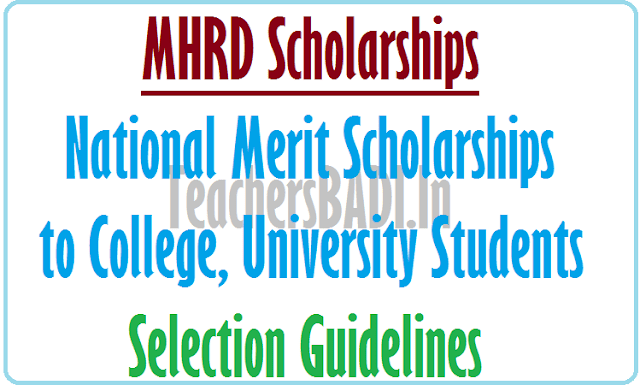 MHRD National Merit Scholarships 2018 to College, University Students, Guidelines for National Merit Scholarships Scheme, Central Sector Scheme of Scholarship for College and University Students. National Scholarships to College, University Students, National Scholarships Class XI to PG level Students. 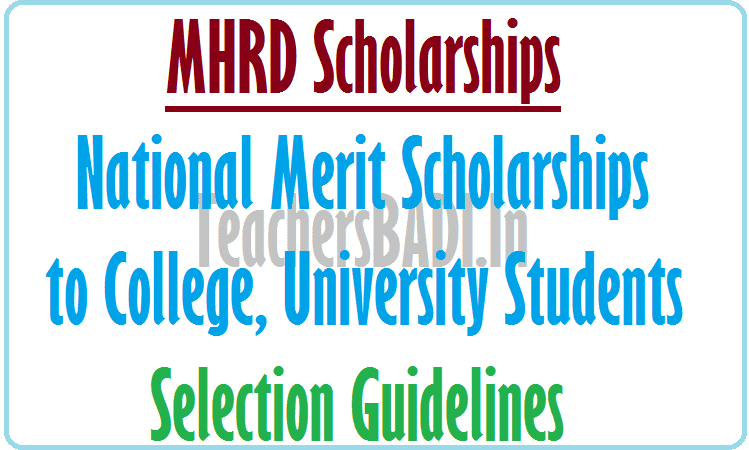 Guidelines for selection of candidates for National Merit Scholarship (MHRD) in Science and Commerce. The scholarships will be awarded on the basis of the results of senior secondary examination. 82000 fresh scholarships per annum [41000 for boys and 41000 for girls] will be awarded for graduate I postgraduate studies in colleges and universities and for professional courses, such as Medical, Engineering etc. country. 50 % of the scholarships would be earmarked for girls. The number of scholarships allotted to a State Board would be distributed amongst pass outs of the Science, Commerce and Humanities streams of the State Board in the ratio of 3:2: 1. Lakh (Rs. 6 Lakh from academic year 2013-14)* per annum. At present, reservations for the various categories are as follows : SC 15 % ST 71/2 % OBC 27 % and horizontally 3 % for Physically Handicapped in all the categories. The examining bodies will draw up a merit list of scholars likely to be eligible for scholarship within five weeks after the results of the examinations announced by the Boards/Universities/Authority for all students. The income of the students' parents will be taken into account before preparing the list. The Boards/Universities/Authority in the State/Union Territory will write to the eligible students from the top of the merit list up to twice the number of scholarships available (to provide for possible refusal and ineligible cases) through a registered letter to confirm within 15 days whether he/she is prepared to accept the scholarship. The candidates from whom replies are not received within 30 days of the State. Board I CBSE I ICSE seeking their willingness will not be considered for scholarship and the award will be given to the next eligible candidates in the merit list. (c) A Form for 'Statement of Particulars'. The shortlisted scholars shall present the Entitlement Card, Income Affidavit form and Statement of Particulars, duly filled-in to the Head of the Institution joined by him/her. The Head of the Institution will complete the Entitlement Card and send it to the concerned State Board, CBSE, ICSE, as the case may be. On receipt of the 'joining report' along with the completed 'Statement of Particulars' and 'Income Affidavit, the concerned Board will then compile· the list of scholarship awardees of that Board on the basis of merit, eligibility criteria and reservation guidelines of the Central Govt. and send the same to the National Scholarship Division of MHRD, Department of Higher Education which will arrange to pay the scholarship to the scholar through a designated bank. The Name, Address for communication and details of bank account of the student in which the scholarship is to be paid, is to be furnished by the Board along with the list. If the concerned Board does not receive the joining report from the candidate duly signed by the Head of Institution, within 30 days from the date of closure of admission in the Institution, the case for award of scholarship to him/her will not be considered. The scholarship will then be offered to the next eligible candidate in the merit list. The rate of scholarship would be Rs.1000/- p.m. at Graduation level for first three years of College and University courses and Rs.2000/- per month at Post- Graduation level. Students pursuing professional courses would get Rs.2000/- per month in the 4th and 5th year. The scholarship would be paid for 10 months in an academic year. income from all sources does not exceed Rs.4.5 Lakh (Rs. 6 Lakh from academic year 2013-14)* per annum, for all categories under the scheme. the graduation level of that course. For all the courses the scholarship would be renewed up to a maximum of five years. The renewal will depend on promotion to the next class provided the scholar secures 60% or more marks or equivalent Grade Point Average in aggregate for the two preceding semesters or of the annual examination which determines his promotion to the next class. It will also be subject to discipline and maintenance of attendance of at least 75% by the scholar. Complaints against the scholars regarding indiscipline including any complaints of having indulged in ragging would lead to forfeiture of scholarship. If a scholar is unable to appear in the annual examination owing to illness and or on account of any unforeseen event, the award may be renewed for the next academic year on submission of medical certificate and other proof to satisfy the Head of the Institution who will certify that the student would have passed with 60% or equivalent Grade Point Average, had he appeared in the examination. A scholar would be allowed to continue/renew his scholarship if he changes the course of study to a stream not offered by his school Board in Class XII (e.g. Law, Fashion Technology, etc.). Students pursuing courses in which the duration is 5 years, would get scholarship of Rs.1000/- per month for the first three years and Rs.2000/- per month for the subsequent two years. Students changing their college/institute of study would be allowed to continue/renew the scholarship provided the course of study and the institution is recognized. A student will be eligible for the scholarship for a total duration not exceeding 5 years regardless of the course and stream of study. Good conduct and regularity in attendance as mentioned above are also required for continuance of the scholarship. The decision of the MHRD will be final and binding in all such matters. Scholarship once cancelled will not be revived under any circumstances. Scholarship will be paid to the selected students directly by the Central Government into a Bank Account opened by them. The payment of scholarship will start from the month the admission is obtained. The scholarship will be paid for a period maximum of up to 10 months in an academic year.